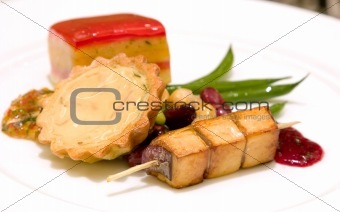 Image Description: Layered polenta and grilled bell pepper cake. Served with pan seared soya tofu and red onion skewer. Accompanied by brie and goat cheese, onion tart, charred tomato and fruit salsa. L 22.0 x 13.7 cm 8.6 x 5.4"